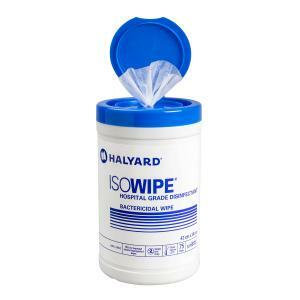 Isopropyl alcohol impregnated wipes offering disinfection of clean surfaces in a convenient wet wipe. Can be used on stainless steel and other hard surfaces, bench tops, trolleys, door handles, office telephones, desks, hand rails and bed rails. Also available in smaller sheet sizes so they are even more economical, as they are both packaged in the same size canister so you only need one size dispenser for both. ISOWIPE are isopropyl alcohol impregnated bactericidal wipes that offer cost effective, bactericidal disinfection of clean medical surfaces. They are suitable for health care and general care.